My family and I have been traveling this last week—a road trip from our home in upstate New York, to my lovely ancestral landscapes of Northeastern Kansas. I had a brilliant idea that we'd make a few paranormal pit stops along the way, so I'd be able to share a bit in this column, and of course, just to see some of the sites I've read and heard about after I moved from the area two decades ago. Near our first stop in Sedalia, Missouri, at my aunt's 80th birthday surprise party, in a town named Marshall, there's the memorial to Jim the Wonder Dog. It seemed interesting, if not a bit silly and fun. This supposedly paranormal canine apparently possessed all manner of curious abilities. Jim was able to respond to requests and commands in Italian, German, Greek, French, Spanish, and English; he could predict the outcome of sports events, knew which fields contained birds for hunting, could pick out correct written answers to various questions (which implies he could read.) According to the Jim the Wonder Dog website, this Springer Spaniel could perform many more “paranormal” feats. But alas, in all the festivities, I forgot about it completely. 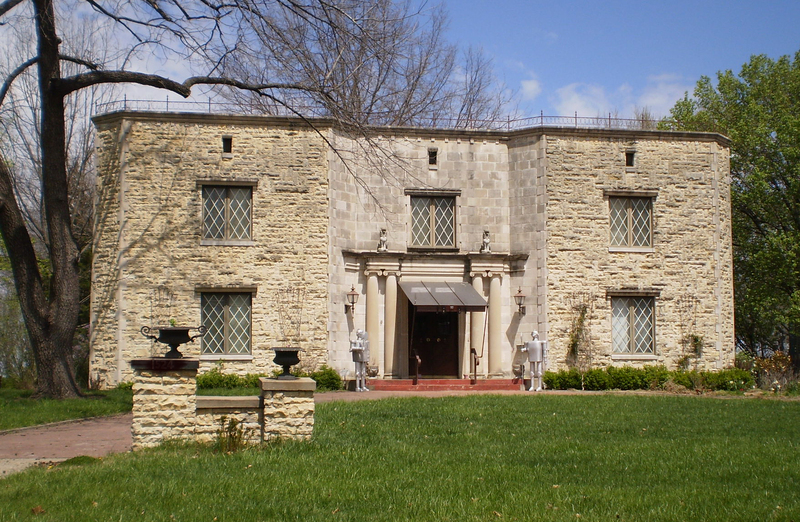 All is not lost, I thought, in Atchinson, Kansas, there's the so-called Sally House near our next destination—my hometown of Topeka. Also close, between Lawrence and Topeka, on Highway 6, is the supposed Gateway to Hell in nearby Stull, Kansas, where the devil himself is said to appear. But, as it often goes when traveling, time rather got away from us, and we didn't have a chance to even go to all the restaurants we would have liked to, let alone plan and take a side trip during the day. 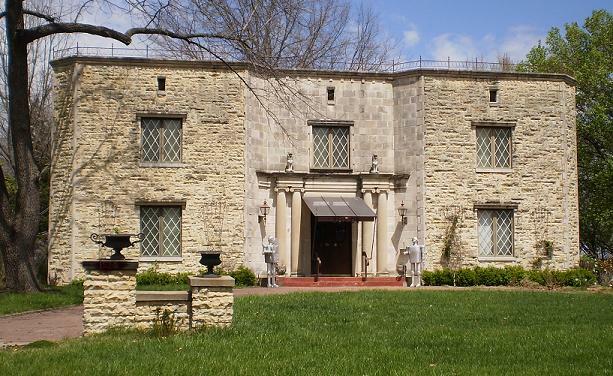 Another thing on my list was looking into a couple Topeka legends—a very haunted house in the gorgeous Potwin area, and a White Lady ghost legend—an albino female spectre that haunts the Rochester Cemetery on the outskirts of North Topeka. Although we'd neglected to try to find an address, while driving around after visiting some old friends, my husband Steve and I decided we'd drive around the small Potwin area near downtown to see if we could recognize the house, of which I've seen photos before. No luck finding the haunted house, but we sure found some eccentric houses, including a mini castle-like manor complete with gargoyles, anchor door handles, and a pair of robot/Wizard of Oz styled Tin Man/armored knights guarding the doorway. See larger version here. Disappointed the paranormal tour was a bust, on our last full night back, around 10:00 PM, I asked Steve if he'd be up to do a spur of the moment ghost hunt out at the Rochester cemetery, to see if we could find any anomalies, or even—the albino lady herself. Yeah, right. For anyone who reads my articles, it's pretty clear I'm very skeptical of the Truth of the developing mythos and narratives involving ghosts and ghost hunting. I find it fascinating, meaningful, and even culturally very significant; I just don't buy it face value. So, on the rare occasion when I involve myself in something such as a ghost hunt, I try to put aside my beliefs, or lack thereof, and just submit somewhat to the conventions and various dubious notions and accoutrements--the EMF meters, the tape recorders, the EVP protocol, the orbs. Ah, the orbs. This is where our otherwise uneventful Rochester Cemetery ghost hunt became interesting. Steve brought some ghost hunting equipment, and after we found the cemetery, we parked and walked the perimeter—he used the EMF meter and tape recorder for EVPs, while I took photos. It was literally pitch black; there were no street lights, no moonlight to speak of. The only illumination we had was a small, weak, LED keychain flashlight and the flash of my camera as I was taking pictures. At first, Steve and I were talking quietly, and I suppose I was distracted while taking photos. I noted sarcastically with mock excitement to him that I had captured several orbs in the photos, which are often attributed to spirits and ghosts. Steve and I separated a bit; as I stopped to take some photos, he walked on ahead. I noticed that within the flash of the camera, there were tiny points of light, as if someone had thrown glitter in front of the camera, as the flash went off. This was not what I was viewing through the lens—as a matter of fact, I wasn't even looking through the lens—I was holding the camera out , pointing at random locations, since it was so dark I could not focus or choose a subject if I had wanted to. I was seeing the points of light/glitter-like stuff in the air, directly in front of myself and the camera—the flash seemed to just be illuminating whatever the material was. The first time it happened, I thought it might be some kind of light-induced optical effect, perhaps similar the way you can sometimes see the blood vessels in your own eyeballs when looking into a very bright light. But, the more times I experienced it, the more obvious it seemed to be there were actually some kind of lights or material physically present in the air. Then, I noticed the extraordinary amount of orbs in the photos I'd been taking. I had Steve see if he could see the lights/glitter as I took photos—he could not. As I continued to take photos, I realized that the glitter I was seeing in the flash directly corresponded to the orbs that showed up in the photographs. I was able to cover the viewfinder/display, (so I couldn't see any orbs that may have appeared) and, by noting what in what type of pattern I had seen the light/glitter within the flash, I could tell Steve exactly where the orbs would be in the resulting photo. This seemed to be some type of proof that there was something physically present, which was showing up as orbs in the photos. But what was it? There was no precipitation, it was not humid, there were no dust, bugs, or anything else that we could feel or see in either the flashlight or car headlights. There were no odd smells, nothing tangible at all. Could it have been pollen, or some kind of material from the trees? 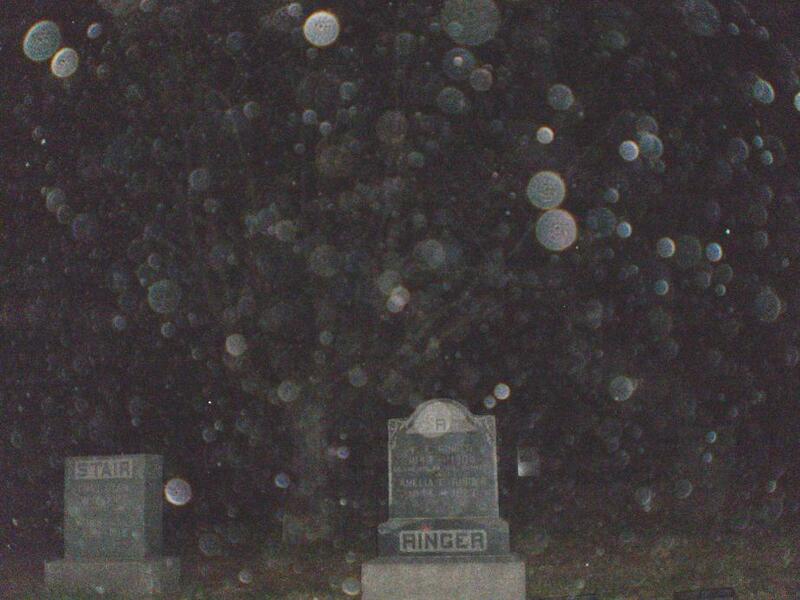 There were several trees in the cemetery, and looking over the photos, it seems as if orbs are grouped near trees. However, when viewing the lights/glitter in the flash, it seemed as if the material was extremely close—right in front of the camera. We got in the car, and drove around with the windows down, taking pictures. We came to a spot where I saw a huge amount of the lights/glitter in the flash, and it was so obvious and unmistakable, that I knew Steve could not help but see it there. I told him to get as near to my view as he could, he leaned in, and I took a photo. There was the most outrageous, awesome display of lights/glitter I had seen yet. Steve was amazed—he saw it this time! The resulting photo has an extreme amount of orbs, with varying sizes, colors, and effects. Some overlap, some seem to be more solid, and some are transparent. There seems to be an unusual three dimensional quality as an overall effect, which I've not seen before in pictures of orbs. Go here to see a larger version of the photo. 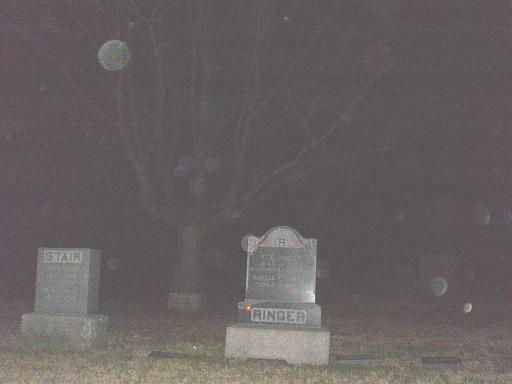 As curious as this experience was, I'm not necessarily proposing that there is something paranormal involved—it seems more likely to me that whatever conditions were present in this particular cemetery in this particular time and place might be the ultimate key to the orb phenomena. On the way back, once we were well away from the cemetery, we stopped the car on a road, in an area without trees. I took some photos, and I saw a lesser amount of the lights/glitter in the flash, and several orbs appeared in the photos. So, this dynamic is clearly not tied to Rochester cemetery. As I write this, we are on the road, making our way back to upstate New York. I'm going to take some photos at night, in different parts of the country, to try seeing the glitter effect and capturing orbs, to determine if place or climate might have something to do with it. I'll post results and an update in a future column. To try it yourself, simply go to a dark area at night, and take photos using your digital camera's flash. As you take the photos, don't look through the viewfinder—hold the camera at chest level, about half an arm's length away. As the flash goes off, note if you can see any tiny, illuminated particles; as I stated before, it looks exactly as if someone has thrown half a handful of orange-gold glitter into the flash.